What a pity that delicious and healthy food spoils quickly! Folks go out of their way to make it last longer but there is nothing better than a good old method of preservation by drying. No wonder that appliance producers have added food dehydration devices to their armoury as a simple and effective way to preserve meat, vegetables or whatever we eat. This guide tells about the types of food dehydrators that are commercially available and the way they work. You will find beneficial tips on what to look for when buying these appliances and how to use them. 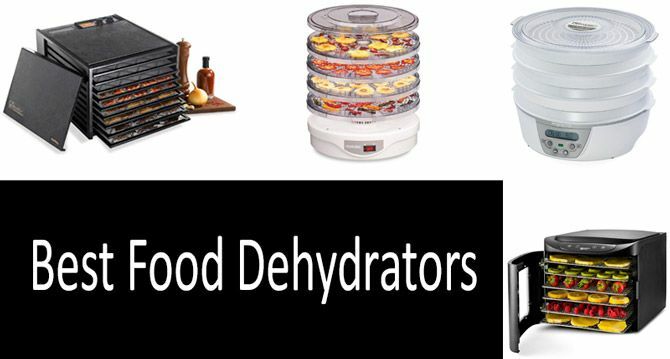 Read our TOP 8 best food dehydrators’ review and learn what affects their price and effectiveness. What used to be a hard and time-consuming process in the past is now easy and fast, and it is all thanks to food dehydrators. These are electrical appliances with two basic components, one of which produces heat and the other circulates air. The latter function is performed by a fan and vents. The device does its job quickly, making the food dry at a temperature of about 140ºF where most bacteria die. What food dehydrator should I buy? An average appliance is shaped like a box, has a chamber with a heat source and a fan to circulate hot air. While some products are equipped with fans, other models allow natural air circulation. Apart from that, the device includes a number of trays, with expandable units and optional trays also available. Food dehydrators can be loosely divided into two types depending on the airflow direction — horizontal and vertical ones. Models with a horizontal airflow have the heating element and fan on the device’s side. Such devices are more effective and have an ocean of benefits. First, flavors from different food items practically will not mix. Secondly, heat is equally shared among the trays and finally, liquids cannot accidentally get into the heating element. Whereas this is not the case with appliances using vertical airflow as their heating elements and fans are mounted at the base. Where to use a food dehydrator? Install it in a dry and well-ventilated place without a source of humidity. Therefore, the kitchen is not recommended as a suitable location. 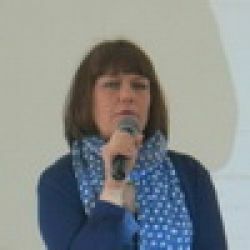 The price and effectiveness largely depend on the product’s features and there is a number of them. The crucial features are capacity, operating parts, construction, cost-efficiency, and safety. So what food dehydrator to buy? Сapacity. It is capacity that makes the unit dry plenty of food in a single shot. This parameter is measured in square feet and means the food amount you will be able to dry within a day. So one pound of food can be dehydrated per square foot of a drying area. Shape. The unit’s shape can be either round or rectangular. The former include stack-on trays, the number of which varies from two to five ones. Rectangular appliances can be as large as 30 inches and they have slide-out trays. There are compact models that occupy less space but using them you will have to spend more time on preparation and clean-up when dealing with large amounts of food. Metal walls. Walls should be made of metal and high-grade plastic rather than wood. This will make the product more durable, easier to clean and safer. However, metal has a weak point as it can diffuse heat to the room. In addition, you should opt for double-wall dehydrators because insulation allows to save energy. Vents. Choose products with adjustable air intake vents so that there can more airflow when the drying process starts. Vents should be screened to prevent the unit’s infestation with insects. The recommended material is either stainless steel or durable plastic. Design. It affects the device performance. Doors and trays should open easily and move smoothly. Lightweight design with smooth edges makes airflow circulate well and through all sides of the food. Heating element. It should ensure a stable temperature so that the dehydration process does not interrupt. The most durable elements are rod-type ones. For round dehydrators, they can be of up to 300 watts while for rectangular models, they can be of up to one thousand watts and even more. Fans. Some models, especially round and compact ones, come without a fan, which is a weak point. Fans are necessary to remove moisture more effectively. Safety features. Walls and trays should be non-flammable while all electric components wired and grounded in the proper way. A thermostat should better be adjustable in the range from 85°F to 160°F. Price. It varies from some thirty dollars to several hundred dollars. But sometimes cheaper does not mean cost-effective. The latter is determined by the product’s capacity. Energy-efficiency. And finally, the unit should consume less energy. To meet this requirement, look for devices with adjustable thermostats. So an 18 square-foot drying area does not require more than 660 watts, while 1,000 watts are needed for 24 square-foot drying area. Pros and Cons of Using Food Dehydrators: What are the main benefits? For those who enjoy cooking. A large variety of delicious foods can be produced by this method. These are dried meat or jerky, fruit leathers, spices, raisins, all sorts of chips made of broccoli, tomatoes, carrots, and other fruits, vegetables, and herbs. They can be eaten as a snack or used in soups. Actually, the list of the end products is limited only by your imagination and creativity. For outdoors activities. They are easier to store because of light weight and smaller size in comparison with the original product before its processing. It is particularly helpful when you are going on a trip or camping, spending plenty of time without a refrigerator. These products cannot spoil nor do they require special containers. For zealous gardeners. Many gardeners grow more fruits and vegetables that can be consumed by them and their families or can be sold on the market. In this case, drying food is a good way to avoid the loss of money, and what is more, replenish supplies. A source of vitamins for the winter season. Although dehydrated fruits and vegetables lose some nutrients, namely vitamins B and C, they still remain healthy food. All nutrients will be preserved there in a concentrated form, in particular, they still will be rich in antioxidants and fiber. So you will be able to add these products to your diet throughout the year. In order to reduce the loss of vitamins and minerals, avoid blanching vegetables before dehydration. According to researchers from the University of Missouri, when blanched, vegetables lose vitamin C and B-complex vitamins, however, vitamin A and thiamin are preserved. To kill bacteria. Since the moisture is removed, bacteria, molds, and other malignant microorganisms do not have the environment to develop there. But to be fair, as scientists from Kansas State University highlight, not all bacteria are destroyed in dried food and this is because the heat treatment was not applied. Buying the right product does not guarantee the quality of the dried food. Much depends on how you prepare it and handle the appliance. And here are some tips on what should be done in the first place. Rule#1. To reduce the risk of food contamination with malignant microorganisms, take precautionary measures. Wash hands before beginning the process. Clean all parts of the device, wash surfaces and containers that will come in contact with food. You should better do it with warm soapy water, where possible. Rule#2. If you are a gardener, dehydrate fruits and vegetables as soon as possible after harvesting. Do not wait until the produce starts spoiling. Rule#3. Put on disposable gloves when preparing meat, vegetables or fruits for dehydration. Remove the gloves if you have to answer a phone call or do something else. Rule#4. Keep meat and poultry in a refrigerator at a temperature of about 40°F for at least two days. Rule#5. Before making jerky, heat meat and poultry to 160 °F and 165 °F, respectively. This measure will help you destroy all bacteria that can be there. In this sense, do not rely solely on dehydrators as the device may not reach temperatures as high as 160°F. Rule#6. After heating the meat or poultry, place the product in the appliance and adjust it so that a permanent temperature of at least 130°F is maintained in the unit. Rule#7. Fruits and vegetables should be dried at temperatures not exceeding 140°F. The thing is that higher temperatures will, on the contrary, prevent moisture from escaping. Let the process run its course. Rule#8. Since humidity reduces the effectiveness of the process, remove all sources of moisture from the room. Air should not be humid, to help this, air out the room thoroughly. Below, you will find a review of the appliances within the price range from $50 to $300. We have started the review with the simplest and cheaper models, with more expensive and feature-packed ones at the bottom. Depending on the amount of food you are going to dehydrate, a different amount of drying space will be needed. This is fairly reflected in the number of trays but to be precise, you should measure it in cubic feet. One more important feature is the availability of an adjustable thermostat. Most of the models come with this feature but the temperature range varies. Bear in mind that the best option is the range between 95 and 165°F. A budgetary choice for starters. You will pay no more than fifty dollars for a device to make your first homemade jerky. There are only 4 trays but they can be adjusted from half an inch to one inch in height. So you can easily place there both small and large-size items. The device is produced by Hamilton Beach that specializes in all sorts of restaurant equipment and apparently knows its stuff. The company said it had tested the device thoroughly both in an engineering lab and kitchen to make sure it works well and meets housekeeper’s needs. Sure, this appliance is simpler in comparison with other items in the review but for such ridiculous money, you get a device providing 3 square feet of drying place and this is more than many other products offer. One more product in this price range, which features only 250 watts but has an adjustable thermostat within the range of 95 and 158°F. It comes with ten removable slide-out trays. With the trays being plastic, the appliance is made of stainless steel, which makes it more durable and resistant to stains than the previous item. Removable trays allow you to easily clean both the unit itself and its parts. According to the manufacturer, the model was scientifically tested. For less than one hundred dollars, you get a compact and productive device. And this is a good price for a 600-watt appliance. A fan is located on the top, which rules out a risk of liquids getting into the heater chamber. Another advantage lies in the horizontal air flow, preventing a mix of flavors. So you will not have to rotate the trays. As for trays, there are only five included but the appliance can be expanded to twelve trays. The number of trays matters as it has a direct impact on the unit’s capacity. They are 13 x 13 inches in size and made of plastic which is a downside as well. Perhaps the major weak point of the product is the absence of a timer to check for the item’s readiness. If you opt for this product, purchase an ordinary timer from a hardware store. But you get a thermostat that can be adjusted to temperatures ranging from 95 to 160°F. However, I should remind you that before drying poultry, you need to heat it to 165°F for safety reasons, which cannot be done in this unit. As a benefit, there is a nice set of accessories for drying soups, sauces, and small items. Within the same price range and wattage, Gourmia comes with 6 trays but is not expandable. It seems that the product has more disadvantages than advantages in comparison with the previous one as its thermostat can be adjusted no more than to 158°F. And yet, it has strong points. First, the unit is equipped with a timer making the appliance shut off automatically. It will also notify you by ringing when the time is over. A fan is mounted on the back side of the unit, making air and heat circulate silently and consistently. What I liked in this product is a transparent door so that you can look at the items inside and check their readiness at any time. Finally, there are also nice little things, such as a fruit leather sheet and drip tray coming with the product. This feature-packed device will cost you less than one hundred dollars. In my thinking, this is a good pickup for those who opt for digital technologies. For a moderate price, you get a unit with a digital thermostat and timer so that you can set the required time and temperature. When a drying process is over, the appliance stops automatically. The most significant benefit of this product is that it provides the widest temperature range — from 90 to 165°F, offering broader opportunities for making dried food. The number of trays is typical for this type of dehydrators: 6 trays are included and the unit can be expanded up to twelve trays. When started, it can operate up to two days without interruption. While, unlike the previous product, there is no transparent door, the item’s top tray comes with a transparent cover so that you can monitor the process at least in one of the trays. Accessories include screens for small items and fruit rolls. Another product by NESCO, more expensive but more advanced device. This 1000-watt device is more powerful than the previous products, which means that you will be able to dry a larger amount of food and for a shorter period of time. And this is only one of the numerous benefits of the model. While the product comes only with four trays, it can be expanded up to twenty ones, providing for 20 square feet of drying space. What I liked in this model is the possibility to program a digital timer for up to 48 hours. But as for adjusting a thermostat, there are fewer options in comparison with Presto. So the maximum temperature the thermostat can be adjusted to is 160°F. A fan is mounted on the top of the device, preventing liquids from getting into the heater chamber. Like in a less expensive NESCO model, this one has a horizontal air flow, which means the flavors will not mix. This model is in a higher price niche and will cost you more than a hundred dollars. A rectangular unit has six trays 13 x 12 inches in size which are made of stainless steel and can be adjusted. Apart from that, several plastic fine mesh trays and non-stick ones are included. However, the model is not expandable, something that is a clear downside. A thermostat is adjustable as well and the unit will automatically shut off when it is required. What surprised me unpleasantly was a limited temperature range for this unit. Its thermostat can be adjusted to no more than 158º F, which is not a good performance for an expensive dehydrator. Worse still, it can uninterruptedly operate no more than 20 hours, which is only half as much as the cheaper NESCO device. On top of that, it has at most 450 watts while other products in the review are 600-watt devices. And finally, we have come to the most expensive item manufactured by the most renown producer of food dehydrators — Excalibur. The product will cost you about three hundred dollars but it really worth this kind of money. With 9 trays included, the unit has 15 square feet of drying space. This means that you will be able to dry lots of food at once, saving on energy bills and avoiding spoilage of fresh fruits and vegetables. If you need to dry bulky items, just remove some of the trays to create extra space in the unit. The device can be adjusted up to 165ºF but the lower temperature is just 105ºF, narrowing the possibilities for drying. Another weak point is that a timer can be adjusted to a maximum of 26 hours of uninterrupted operation. You should clean all utensils and trays of the device. Wash them with warm, soapy water. To sanitize, apply bleach. There are two helpful recipes. First, you need one and a half teaspoons of bleach. Mix it with water and place the parts in the solution for ten seconds. After that, dry them with an air flow, not using a towel. Another way is making a spray, for which you will need a half teaspoon of bleach and a quart of water. Mix them and pour into a spray bottle. Apply the solution to the unit’s surfaces that come in contact with food. How long does it take to dry food in the appliance? It depends on the specific product and the temperature you set. But in general, it will take the device from 10 to 20 hours to do the job. Chips are the most time-consuming product requiring about 20 hours of drying. Herbs can be dried within several hours. A food dehydrator vs a convection oven: which one is better for drying? The main disadvantage of using ovens is that you cannot control the lower temperatures. In fact, you are unlikely to achieve precise low temperatures in an oven to dry foods, therefore, a dehydrator performs this function much more effectively. Apart from that, there can be insufficient air circulation in an oven. Low temperatures are important to preserve the product’s nutrients and make their flavors stronger. The main danger lies in thinking that drying is a substitute for heating, whereas this is not the case. You should better heat meat and poultry before dehydrating or adjust the appliance to a temperature of at least 160 °F to destroy bacteria. Keep in mind that after drying bacteria become more resistant to heat. Can the device catch fire? In case the device’s wiring is defective, there can be a risk of fire because of the heat build-up. And yet, the temperatures of these appliances are low enough to worry about a fire hazard. They can run the whole day with no problem. You may turn the device on for a short period of time to make sure that it works properly before leaving it on for 24 hours. Can I leave a food dehydrator unattended? Yes, the device can run on its own. Just make sure there is enough ventilation. For this reason, you should better put it on the table or an open shelf. Feel free to leave it run for the two or three days, but first check the manual of your particular product.